Most weeks, I plan our menu carefully. I have main courses and sides figured out, and try to coordinate them to make the best use of ingredients without things going to waste. Other weeks when we are so busy that I don’t even have time to make a firm plan, I stock up on the things I know we will use and end up cooking on the fly. Chicken, tortillas, salmon, kale, pasta…I know I can make something delicious every night when we have our favorite basics on hand. With salmon especially, it is so easy to fall back on one of my two or three favorite recipes. Last week I wanted to switch things up, and suddenly I remembered a restaurant dish I had many months ago. 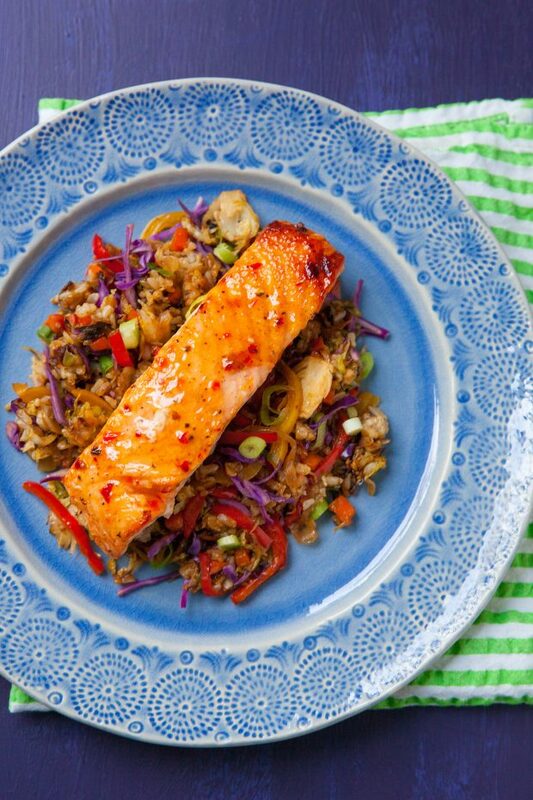 Using that as my inspiration, I came up with this Thai chili glazed salmon over rainbow veggie fried rice and, well, now we have a fourth favorite salmon recipe. Since fried rice requires rice that has already been cooked and fully cooled, and because of all of the chopped/sliced veggies in this dish, this meal does require a bit of foresight. If made all at once it is not ideal for a weeknight. However, let me recommend my strategy. While the rice is cooking, go ahead and prepare the veggies – slice the onions and peppers, dice the carrots, shred the cabbage, etc. If the prep is done ahead of time, this becomes a quick meal that is totally amenable to a weeknight. This meal is fabulous because it is simultaneously fresh, colorful, and comforting. The whole family absolutely loved this meal and I hope yours loves it too! Rinse the rice in a fine mesh sieve under cool water. Shake to drain. Add the rice to a medium saucepan and combine with the salt and water. Bring to a boil over medium-high heat, then reduce the heat to a simmer, cover, and cook according to the package directions depending on the type of rice you are using. Once the rice is fully cooked, transfer to an airtight container and refrigerate until thoroughly chilled, at least 8 hours. Once the bottom side is seared, brush the tops of the salmon fillets lightly with some of the chili sauce, taking care not to reuse the brush that has touched the undercooked salmon in the sauce that will be used later. Transfer the pan to the preheated oven and roast for about 4-5 minutes. Check the internal temperature of the salmon with an instant read thermometer. It should read about 140˚ F. When this temperature is reached, turn on the broiler. 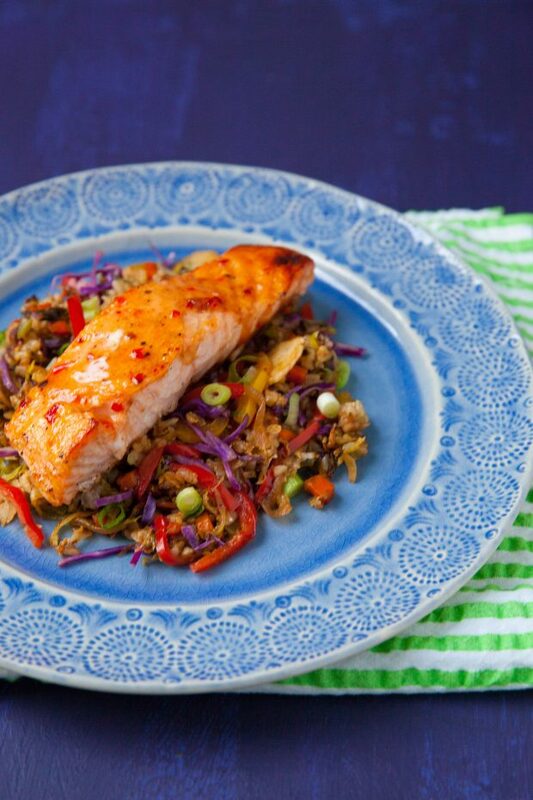 Brush the tops of the salmon fillets with a second generous coat of the chili glaze and return the pan to the oven. Allow the broiler to finish cooking the salmon, browning around the edges and on top. The salmon is finished when the internal temperature reaches 160˚ F. (Keep in mind that some pieces may finish cooking before others due to size variation – remove those and continue cooking the rest.) If your broiler is super strong and the salmon browns to your liking before the target internal temperature is reached, switch off the broiler and back to the 425˚ F oven to finish cooking through. While the salmon is cooking, make the fried rice. Heat 1 tablespoon of the oil in a large sauté pan over medium-high heat. Add the sliced onion and bell peppers to the pan and cook until just beginning to soften, about 2 minutes. Add in the carrots, brussels sprouts, and white scallion parts and cook until those vegetables begin to soften, about 2 more minutes. Stir in the ginger, garlic and red pepper flakes and cook, stirring constantly, until fragrant, about 1 minute. Transfer this whole mixture to a separate dish and set aside. If necessary, add one more tablespoon of oil to the pan. Add the green scallion parts and stir quickly, then add the cold rice to the pan in an even layer, breaking up the clumps. Let cook without stirring, about 2 minutes, so that the scallions and the rice begin to brown on the bottom. Stir briefly to turn some of the top layer to the bottom of the pan and cook again without agitating, 2-3 more minutes. Once the rice is beginning to be well browned and the scallions are charred, return the rest of the cooked vegetables to the pan. Add in the soy sauce and stir to combine everything well. Stir in the cabbage. Cook just until the mixture is fully warmed through. Remove from the heat and stir in the sesame oil. Taste and adjust seasoning as necessary. Add a portion of fried rice to each plate. Carefully slide a spatula between the flesh and skin of the salmon to remove the skin, and place each fillet on top of a bed of fried rice. Serve immediately. Note: I like to use the slicing blade of my food processor for thinly slicing brussels sprouts because it is very convenient. The cabbage can also be shredded this way. However, both tasks can be done perfectly well with a knife.